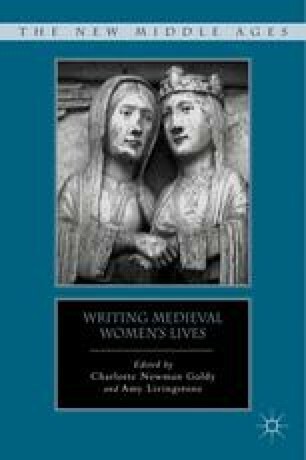 High status did not guarantee queens, abbesses, and other elite women, anymore than servile women, a place in the surviving texts from the Carolingian Empire.1 As others have emphasized in this volume already, traditional biography is only rarely a way to tell the stories of medieval women, even more so Carolingian women.2 This chapter will trace a picture of two women, Girlindis and Alpais, who lived in the western part of the Carolingian Empire in the ninth century and who fabricated textiles, a crucial activity of Frankish women of every status. Medievalists have only recently come to appreciate the importance of textiles in the early Middle Ages, and few have recognized the prominence of cloth in the Carolingian world, largely due to the paucity of textiles that survive from that time and place. Given the silence of our sources about both individual women and cloth fabrication, learning about Alpais and Girlindis as individuals proves impossible. Examination of a wide variety of sources, both material and textual, allows for a glimpse of their possible experiences even when they do not pertain directly to the women in question. Archaeology, for instance, helps to illuminate the life of Girlindis while examining family members aids in learning about Alpais.3 Previous inattention makes it all the more desirable to examine these two textile fabricators as well as a surviving piece one produced.